With Black History Month in mind, there are plenty of monuments, streets, and parks around the city named after noteworthy African American individuals. 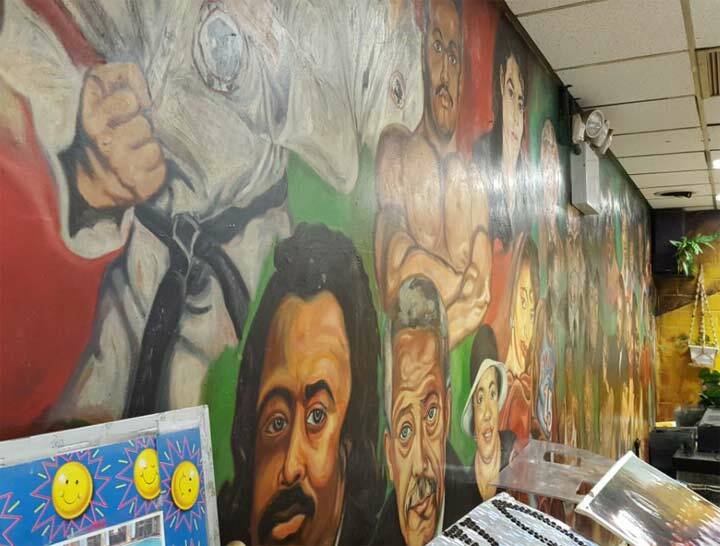 Keeping in tune with the mission of Forgotten-NY, there is a place in the city that has wall-to-wall coverage of black history, perhaps the largest collection of public indoor murals in the city. 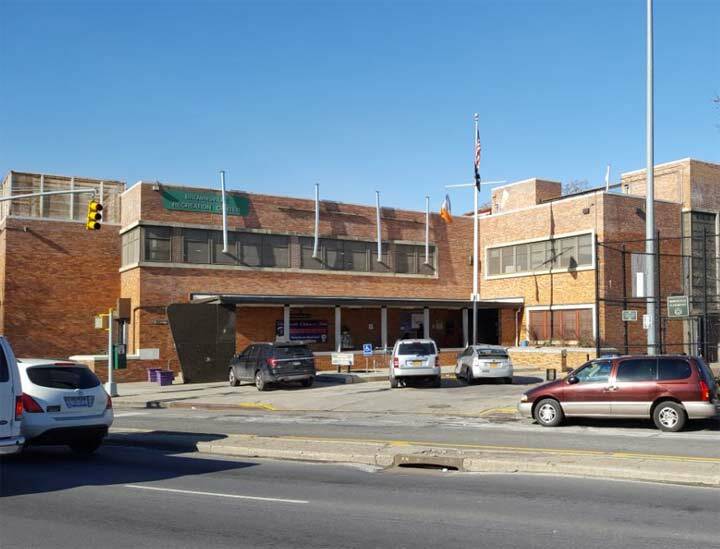 At the corner of Linden Boulevard and Mother Gaston Boulevard is the Brownsville Recreation Center, operated by the city Parks Department. It was completed in October 1953 as the Brownsville Boys Club, a nonprofit community center run by Abe Stark. He’s the one famous for the “hit sign, win suit” billboard at Ebbets Field advertising his clothing store on Pitkin Avenue. Once a predominantly Jewish neighborhood, Brownsville experienced a quick demographic change in the 1950s with African Americans as the new majority. In 1954, Stark donated the Brownsville Boys Club to the city, which reopened as a recreation center in the following year. 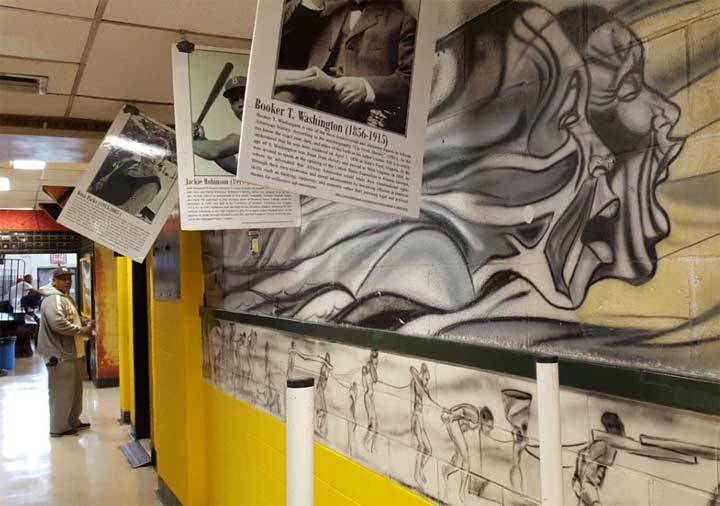 Over the years the center’s staff and visitors have painted each wall with specific themes relating to black history. One wall shows slaves marching in chains to the West African coastal forts where ships took them to the Americas. The gray tone of the mural suggest this scene as a distant memory. 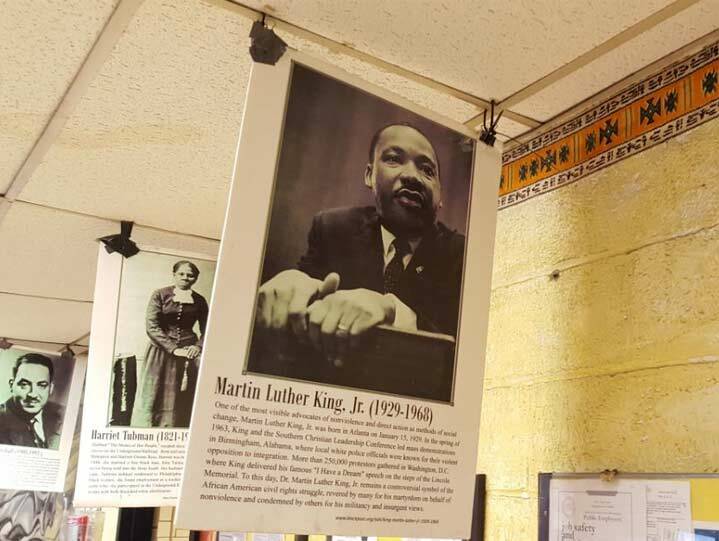 Hanging from the ceiling are panels of famous individuals who impacted African American history, such as Booker T. Washington, Jackie Robinson, and Rosa Parks. The hallway connecting the entrance lobby to the swimming pool has African-themed patterns along the ceiling line and more posters. Increased interest in ancestry has prompted many public artworks and buildings in majority black neighborhoods to feature African-themed designs as a way of commemorating heritage. Prior to European colonization Africa had a number of notable civilizations that built cities and ruled over empires, such as Great Zimbabwe, Songhai, Ethiopia, and Nubia. But in the African American imagination, Egypt receives the most attention, having flourished for millennia before being conquered. 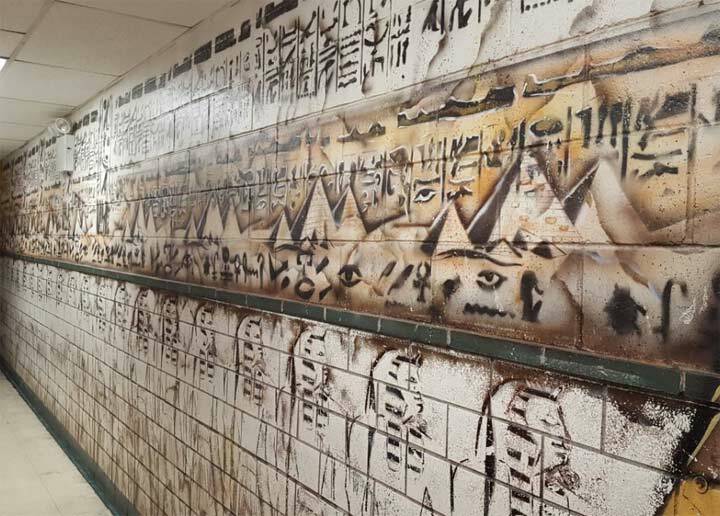 I am not familiar with hieroglyphics, but presume the ones in the mural are accurate and have a message for those who can read them. In the entrance lobby is a mural of more recent individuals who left an impact on African American history. The mural is undated but looking at the likeness of the Rev. Al Sharpton, it must be the early 90s, before he famously reduced his weight. Next to the activist is David Dinkins, the city’s first black mayor. 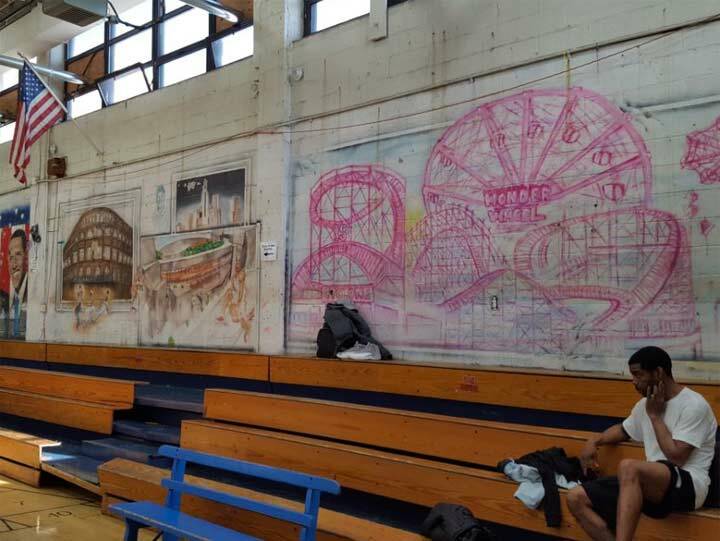 In the basketball court, a mural celebrates Brooklyn attractions then and now with Brooklyn Bridge, Ebbets Field, Barclays Center, and Coney Island. The amusement district is painted in pink, appearing unfinished and at the same time reminiscent of neon lights. 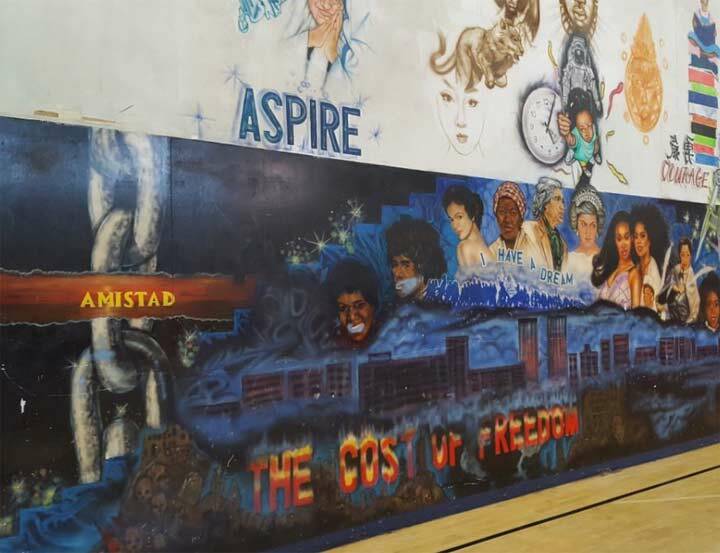 On the wall opposite the Brooklyn destinations the Aspire wall displays chains evoking the Amistad uprising, where a slave ship was commandeered by its captive passengers and after a sensational trial, they returned to Africa as free men. It was a rarity: a slave revolt that achieved its objectives. 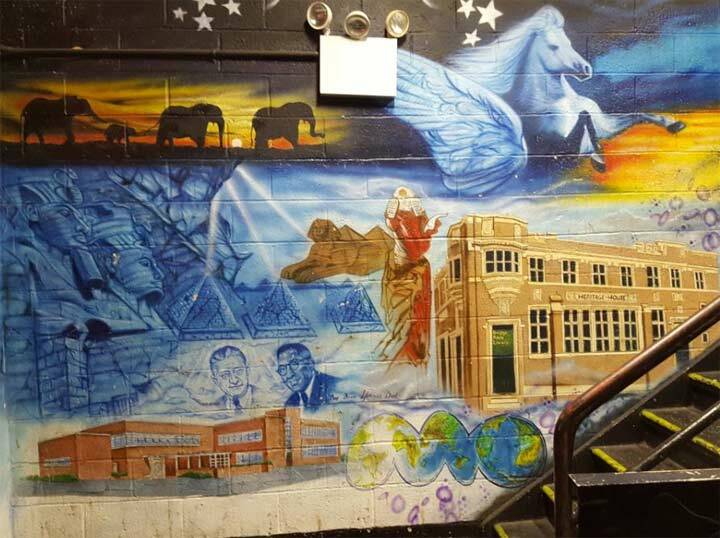 The room connecting the basketball courts with the Golden Age Center within the building has a cosmic-theme mural that also honors local history. Above the Brownsville Recreation Center is a portrait of Abe Stark and the Rev. Boise Dent, two of the founding figures of this center. Also worth mentioning is Greg “Jocko” Jackson, a former New York Knick who was raised in Brownsville and returned to it after retiring from professional sports. In 1997 he became the manager of Brownsville Rec, cleaning up the place, keeping ruffians out, and transforming it into a neighborhood attraction. Jackson removed the unsightly bulletproof glass from the center’s entrance and enlisted local muralists to decorate its interior walls. He died at 60 in 2012. 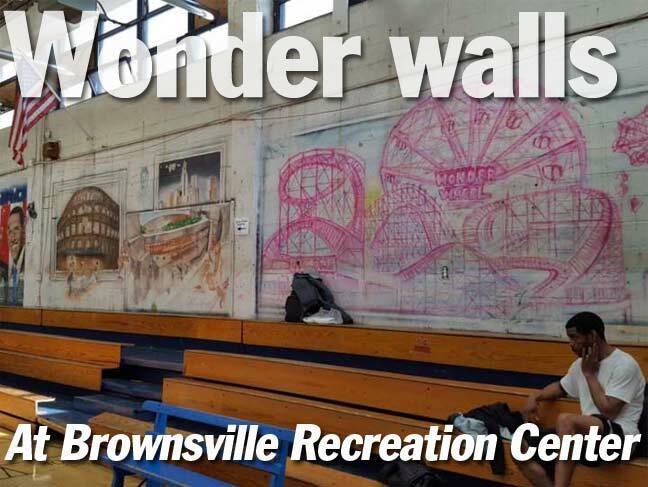 With so much art to see and things to do, on a cold winter day Brownsville Recreation Center can call itself an indoor park. Hello….i attended the brownsville boys club,between 1955 and 1959….hoping people who attended remembers….mr.thomas farkas of the Fiji island police dept.